Nagaland is referred to as the ‘Switzerland of the East’ for its beautiful scenery. Nagaland is also a home to a number of indigenous tribes and each of these tribes celebrates the festivals with great passion and devotion because it has been passed through their ancestors. The “Hornbill” Festival is one such festival organized annually which showcases the varied rich culture of Nagaland. This festival unites the sixteen odd Naga Tribes at a village called ‘Kisama’ where they come together under one roof to display their native art. The Festival is named after the bird “Hornbill” which is a tribute to the most revered bird of the Nagas. The Nagas admired the bird for its alertness and grandeur qualities and have interlinked the bird to the socio and cultural life which is evident in the folk dances and songs. Also, the bird is symbolically represented on all traditional headgears worn during the festivals. The “Hornbill” Festival was started a decade back in the year 2000 to encourage inter tribal interaction by celebrating the festivals of the various tribes under one umbrella. It is organized by the State Directorate of Tourism which is mainly intended to encourage tourism and protect and preserve the richness and uniqueness of the Naga Heritage. 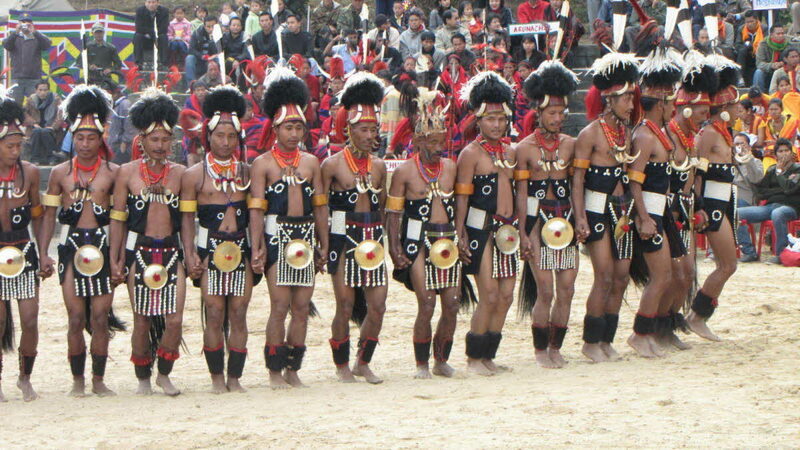 The ‘Hornbill’ festival is attended by all the major tribes in Nagaland. The celebration includes traditional arts, dance, folk songs and some games. The traditional folk dance is mainly known for its robust rhythm. The folk songs sung are melodious and are based on the bravery of the ancient warriors and heroes. The main attraction is the Hornbill National Rock Concert which starts late in the evening. This concert is perhaps the only concert in the entire nation that lasts for a week’s duration. Winning the coveted title is like a dream come true for most of the rock bands. All these celebrations are organized amidst a perfectly built replica of the tribal settlements, usually built with wood carvings and hollow log drum instruments, which are beat at the end of each day. Food stalls with local delicacies, herbal medicine stalls, and handicrafts stalls are also a main attraction as they promote tribal art. The “Hornbill” festival usually revolves around agriculture and this is seen is most of the dance forms which often depict the happiness of a bountiful harvest. The “Hornbill” festival was earlier celebrated only for five days but now the festival is a Grand celebration for seven long days and has the potential to even increase the number of days for the celebrations in future. The festival is held in the first week of December every year, i.e, it is celebrated from the 1st of Dec to the 7th Dec every year at the Kisama village near Kohima. The festival lasts for seven days but it looks like it gets over within a flash. The finale of this “Hornbill” festival is a very grand affair where every tribe lights the bonfire as the sun sets. The village Kisama looks beautiful at night after the sun sets when the tribes dance around the bonfire they lit. The sky looks red and black and people return back happily and wait eagerly for the next festival.